FFT is a throwing- type fire extinguisher for initial fires. No matter how old or young you may be, a simple “throwing” method can be easily carried out in an emergency of an early-stage fire. This product and its extinguishing agent got the approval from KFI(Korea Fire Institute of Industry & Technology)and passed the safety test from KTR(Korea Testing & Research Institute for Chemical Industry). Throw it at the flame. Splash it at the fire. Fire on hard and solid items: Throw the product directly into the flames. Oil fire: Throw the product at the wall or the floor close by and let the liquid spread and cover the flames. Excellent power : FFT suppresses fire with its chemical reaction and cooling effect within 3-5sec. When the extinguishing agent meets fire, the bubble foam and the gases (carbonic gas and ammonium gas) are generated. It blocks Oxygen and suffocates the fire with cooling effect. Practical : FFT is suitable for emergency situation of an early-stage fire and because it is easy to use, anybody can use it regardless of age or gender at any positions without shaking like the powder ones. Economical : FFT requires no recharge and no regular check-up, thereby saving time and money. Most of extinguishers require recharging and regular checking once every 6-12months but FFT will set you free from these hassles. Extensive application : FFT has an outstanding extinguishing power to suppress an initial stage of A-class fire(wood, paper), B-class fire(oil) and C-class fire(electricity). It works great at any temperatures ranging from -20C to 80C. (For the product available at lower temperatures, See FFTP.) It also works well under any kind of weather conditions, unlike Holon or gas based extinguishers that may not work properly at outdoors when windy. Eco-friendly : The liquid agent of inside FFT is harmless to human, animals and nature. The result of skin irritation test shows that its irritation index is “zero(0)” from KTR. And any hazardous materials including PFOA or PFOS don’t be detected from the liquid. What is the advantage of FFT? The advantage of FFT is that men and women of all ages, even with disabilities, can easily use this tool. Keep in mind that the most important thing is the suppression at an initial-stage when a fire occurs. Is the extinguishing agent safe? Yes. It has passed the safety test from KTR(Korea Testing & Research Institute for Chemical Industry). The agent is absolutely eco-friendly to human, animals and nature. Is it dangerous when a bottle is shattered? No. 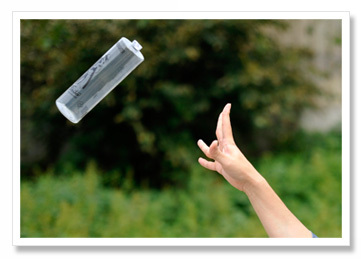 The bottle is made of special breakable plastic which does not injure human body. How big of fire can 1 bottle handle? KFI recognizes A-class fire/1 unit for FFT. You can see the size of 1 unit on our video clip. It is sufficient to suppress an initial-stage fire. Can it extinguish all three of A, B and C fires? Of course. FFT can be used on all three if used properly. Is FFT a proven product? Yes. 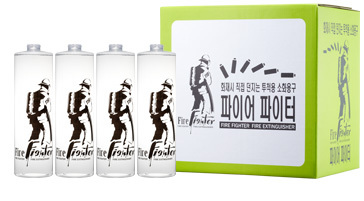 This is the No.1 throwing-type fire extinguisher in Korea. FFT has obtained KFI approval(Korea), SIRIM certification(Malaysia) and ISI mark (India). Acquiring certifications in Turkey, Russia and other countries is currently in process . The working temperature range of FFTP is from-40C up to 80C and this temperature range covers pretty much every region in the world. FFTP is the result of a scientific and in-depth research of many years and has achieved two purposes: functions well in extreme cold and fulfill the significant extinguishing power. However, other Fire extinguishers available for lower temperatures have less extinguishing abilities.